It is important to understand that a unit can be an ionic air purifier without releasing harmful amounts of ozone into your environment. Definition: Ionic filtration is one of the newest Air Purifier technologies that generates and releases healthy negative ions into the air to adhere to airborne pollutants and then either collect and contain them within the air purifier or have them drop to the floor to be vacuumed or swept up for disposal. 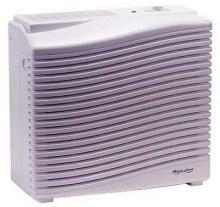 Often used with a HEPA Filter and Carbon Filter for containing other airborne pollutants and odors.